The scene of a shooting late Thursday night on Expressway about a quarter-mile east of Airway Boulevard. A related shooting early Friday morning in the Evaro Hill area involved a police officer, according to the Missoula County Sheriff's Office, and prompted a massive manhunt. 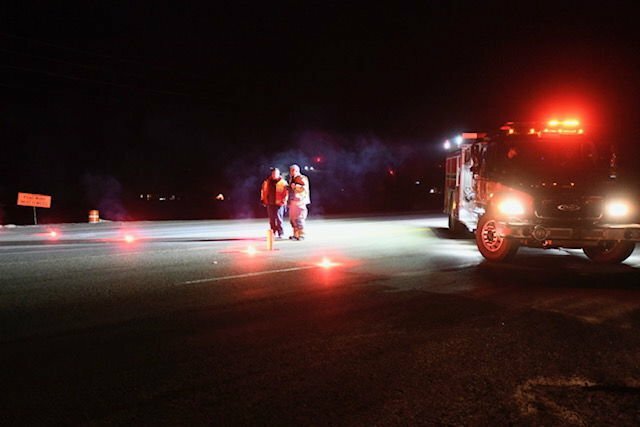 Frenchtown Fire mans a roadblock on Highway 93 North at Waldo Road after two related shootings late Thursday night and early Friday morning prompted a manhunt near Evaro Hill. Law enforcement maintained roadblocks, like this one at Highway 93 and Ladyslipper Road, throughout the night on a stretch of Highway 93 during the manhunt for a suspect in a Montana Highway Patrol officer's shooting early Friday. The suspect, Johnathan Bertsch, was arrested at 6:15 a.m. without incident, according to the Missoula County Sheriff's Office. Montana State Troopers man the roadblock at Highway 93 and Ladyslipper Road. Johnathan Bertsch, was arrested at 6:15 a.m. without incident, according to the Missoula County Sheriff's Office. Yellow spray paint and blood indicate the location one person was found by law enforcement late Thursday night on Expressway near Airport Blvd. Three people were taken to the hospital with gunshot wounds, according to the Missoula Police Department. Tara Chevalier, the catering manager at Providence St. Patrick Hospital, places a yellow rose on a Montana Highway Patrol car parked Friday morning outside the hospital, where trooper Wade Palmer was in critical condition after being shot near Evaro early in the morning. Chevalier placed roses on several law enforcement vehicles in a show of support. Law enforcement comb the scene of the shooting near the Evaro Bar on Friday afternoon. Law enforcement collect evidence at the scene of the shooting near the Evaro Bar on Friday afternoon. Trooper Wade Palmer's patrol car sits at the scene of the shooting riddled with bullet holes. Law enforcement combs the scene of the shooting near the Evaro Bar on Friday afternoon. A convoy of law enforcement officers leave the command center after shooting suspect Johnathan Bertsch, was arrested at 6:15 a.m. without incident, according to the Missoula County Sheriff's Office. A law enforcement officer drives down Highway 93 during the manhunt for a suspect in a Montana Highway Patrol officer's shooting early Friday. The suspect, Johnathan Bertsch, was arrested at 6:15 a.m. without incident, according to the Missoula County Sheriff's Office. Johnathan Bertsch, 28, was booked into Missoula County Detention Facility on suspicion of deliberate homicide and aggravated assault. Law enforcement covers Montana State Trooper Wade Palmer's bullet riddled car at the scene of the shooting near the Evaro Bar on Friday morning. Palmer was in critical condition and flown to Salt Lake City for treatment after suspected shooter Johnathan Bertsch, was taken into custody south of Evaro at about 6:15 a.m. according to the Missoula County Sheriff's Office. Tara Chevalier, the catering manager at Providence St. Patrick Hospital, places a yellow rose on a Montana Highway Patrol car parked Friday morning outside the hospital, where trooper Wade Palmer was in critical condition. Chevalier placed roses on several law enforcement vehicles in a show of support. Montana Highway Patrol Troopers gather after the medical plane carrying Trooper Wade Palmer to Utah takes off from the Missoula airport on Friday. Yellow spray paint and blood indicate the location one person was found by law enforcement late Thursday night on Expressway near Airport Boulevard. Three people were taken to the hospital with gunshot wounds, according to the Missoula Police Department. A law enforcement officer drives down Highway 93 during the manhunt for a suspect in the shootings early Friday. The suspect, Johnathan Bertsch, was arrested at 6:15 a.m. without incident, according to the Missoula County Sheriff's Office. The medical airplane carrying Trooper Wade Palmer to Utah for treatment is readied with Palmer aboard on Friday at the Missoula airport. A motorcade of law enforcement vehicles escorts Trooper Wade Palmer's ambulance on West Broadway to the Missoula airport on Friday. Law enforcement officers, firefighters and others line the tarmac at the Missoula airport Friday as Trooper Wade Palmer is readied for the medical flight to Utah. Dozens of law enforcement officers came and went Friday morning at Providence St. Patrick Hospital where Trooper Wade Palmer was in critical condition after the shooting. One person was killed, a Montana Highway Patrol trooper was in critical condition and two others were hospitalized after a shooting spree in Missoula and Evaro that resulted in the arrest of one suspect. Trooper Wade Palmer, who was flown Friday afternoon to Salt Lake City for treatment, was shot in his patrol car after he found the suspect's car near the Evaro Bar and Casino early Friday morning. When a second trooper arrived at the scene, he found Palmer still belted into his patrol car; the suspect had fled, said a release from the Highway Patrol. Three people had been shot an hour earlier as they were leaving Marvin's Bar at the Wye, just west of Missoula. Shelley Hays, who had been sitting in the back of the pickup truck, was found dead when authorities arrived, according to court documents. Julie Blanchard, who was driving the pickup, and her son Casey Blanchard, were wounded and taken to St. Patrick Hospital. Johnathan Bertsch, the suspected shooter, was taken into custody in the 16000 block of Thornburg Way south of Evaro at about 6:15 a.m. without incident, according to the Missoula County Sheriff's Office. Bertsch was booked into the Missoula County Detention Facility at about 1:15 p.m. on Friday. Hours later, Missoula County Attorney's Office filed four charges against him: one count of deliberate homicide and three counts of attempted deliberate homicide. A motorcade Friday afternoon escorted Palmer from St. Patrick Hospital to the Missoula airport. Montana Attorney General Tim Fox was flying to Utah to meet the trooper and his family, according to Montana Department of Justice spokesman John Barnes. Palmer has been with the patrol since 2012 and was assigned to Detachment 112 in Missoula. In 2015, he was awarded the Patrol's highest honor, the Medal of Valor, for "his heroic lifesaving efforts at the scene of a multiple-vehicle crash involving a mother and her young children in December 2014,'' according to a patrol news release. Palmer has a wife and two young children. The mood was somber Friday morning on Evaro Hill as investigators worked the scene where the trooper was shot. His vehicle was still parked at a pull-off in front of the Evaro Community Center, and dozens of law enforcement officials combed the scene as cold wind whipped over the snow. Multiple bullet holes were visible on the car's windshield and on the passenger side. Dennis Finnegan, a bartender at the Evaro Bar and Casino, said he didn't hear any shots fired early Friday morning. Because investigators blocked off Highway 93 after the incident, Finnegan had to sleep at the bar. "I guess one of the other bartenders heard gunshots, because she lives up here, but she's taking her kids to school now," he said. None of the law enforcement personnel on the scene at Evaro Hill on Friday spoke on the record to the media except to respectfully ask for discretion when taking pictures of a crime scene. Just before noon, the trooper's vehicle was towed away. Around midnight, shots were reported near Evaro Hill, triggering a massive manhunt that saw all traffic blocked on Highway 93 North between mile markers 3 and 10 as law enforcement from multiple agencies spent hours searching for a man driving a white SUV, and believed armed with an AR-15 and a .45, according to scanner reports. "Obviously, our thoughts are with the trooper and Highway Patrol," Welsh told the Missoulian. Lake County Sheriff Don Bell told the Missoulian his team secured Bertsch's Arlee residence, and removed his grandfather from the property, after learning Bertsch may have been heading north from Missoula Thursday night. It was all hands on deck for the Lake County deputies, assisted by Confederated Salish and Kootenai Tribal Police, who set up six surveillance points along Highway 93 hoping to snag Bertsch. "When a person lives in my county, and does a crime in another county, we want to contain him as soon as we can so he doesn't hurt anyone else," Bell said. Residents in the Evaro Hill area were warned to lock their doors and immediately call 911 to report any unusual activity. St. Patrick Hospital issued a lockdown on its facilities from 11:41 p.m. until 1:43 a.m. after reports of a shooting suspect at large. Friday morning, dozens of vehicles from the highway patrol, Missoula police and the sheriff's office crowded the parking lot at St. Patrick as law enforcement officers trickled in and out to pay their respects and to investigate. Tara Chevalier, the catering manager at St. Patrick Hospital, came outside with an armful of yellow roses and went from patrol car to patrol car, placing yellow roses on the windshields. Eric Klemencic came to the hospital with containers of coffee from Starbucks Friday morning. Klemencic, who works at Cross Point Community Church, said he didn’t personally know Palmer but heard of the incident from a trooper in his church group. "I just thought they’ve been there all night, I'm going to bring them some coffee and come pray with them." Klemencic said Starbucks donated the coffee when he explained the situation. The Arlee School District notified parents and students on its Facebook page early Friday that all school-related activities, including sports practices, were canceled due to the situation in the Evaro area. Highway 93 north of I-90 remained closed for more than nine hours, from 12:54 a.m. Friday until 10:09 a.m., backing up traffic onto the interstate. After crime scene investigators cleared the scene on Expressway Friday morning, a yellow spray-painted outline and blotches of blood indicated where law enforcement found one of the shooting victims. More than 30 yellow spray-painted circles appeared to show where ammunition casings were found in the same area on the corner of Expressway and Grizzly Court. According to a 2009 Missoulian article, then-18-year-old Bertsch allegedly fled police after stealing gas and, at the end of a pursuit, rammed his car into a law enforcement officer's patrol car, and attempted to gun the vehicle for the officer as well. Missoulian reporter Kim Briggeman contributed information for this story. The reporters can be reached at seaborn.larson@missoulian.com, david.erickson@missoulian.com, cameron.evans@missoulian.com and kim.briggeman@missoulian.com. Authorities were on the site of an "active crime scene" on Expressway near the Lithia car dealership late Thursday night. An area on Expressway near the Lithia car dealership was blocked off late Thursday night as authorities responded to an "active crime scene." Law enforcement collects evidence at the scene of the shooting near the Evaro Bar on Friday afternoon. This story has been updated to correct the spelling of Shelley Hays' last name.